Natures Harvest Adult Complete Dog Food with Lamb and Rice is a natural complete dog food, made from the freshest meat, whole brown rice, carrots and peas. The sole meat ingredient in Natures Harvest Adult Complete Dog Food with Lamb and Rice is fresh lamb; ideal for dogs with a dietary sensitivity to other meats or fish! By avoiding ingredients which commonly trigger foods intolerances and food allergies, Natures Harvest's gentle recipe will help calm even the most sensitive stomach or skin! Natural hypo-allergenic recipe, made from fresh meat; Single meat protein species, helping owners avoid allergens; Contains no soya, beef, pork, eggs, dairy products or wheat gluten; Free from all artificial preservatives, colourants and flavourings; Formulated to match a dog's diet in the wild. 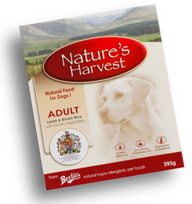 Natures Harvest is a complete food and can be fed as the sole food to your dog. Fresh Meat is delivered direct from the abattoir, where it is simply minced, carefully blended with the other ingredients and sealed straight into the pack. The special steam-pressure method ensures the food is properly cooked and will keep at room-temperature for many months without the need for any preservatives.